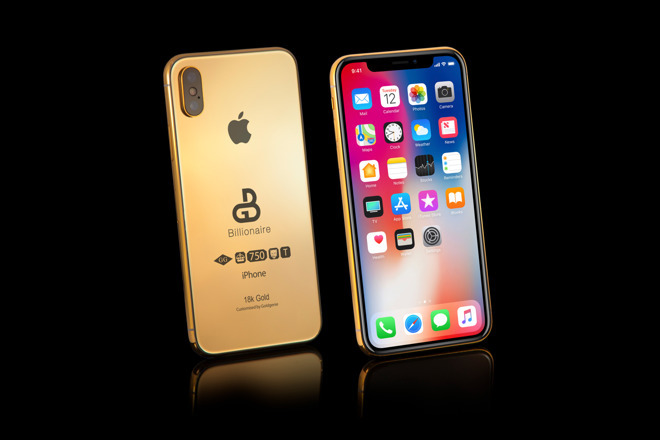 The British company that offers gold-plated versions of iPhones and other high-end products is listing an 18-karat gold version of what it calls the iPhone XS —for over 100 times the price of a regular iPhone X.
Goldgenie is listing the "Billionaire Solid Gold Edition" of the "iPhone XS," which Goldgenie describes as "the brand's most luxurious product to date." The 18-karat gold-plated product product has a listed price of 100000 euro, or over $113,000, although ordering it now requires only a 50 percent deposit. The Solid Gold Edition is only available in a 256GB edition, and comes with a luxury Cherry Oak Finish Box and VIP Concierge service membership for 5 years. Apple does not cooperate with Goldgenie, or have any formal business relationship at all. So, this offering shouldn't be considered a vendor leak, or any type of confirmation that one of the upcoming iPhones will be called the XS. Goldgenie appears to be guessing that Apple will be using the "XS" name in its 2018 iPhone line this fall. Goldgenie has been around since the 1990s but gained prominence in 2007 when it was featured on Dragon's Den, a Shark Tank-like entrepreneurship competition TV show in the U.K. Earlier in 2018, the company offered a 24-karat gold-plated iPhone X, for just under $4,000, to commemorate the wedding of Prince Harry and Meghan Markle. It also offers a gold-plated iMac 5K, for $13,296. The website copy also describes Goldgenie as "the first company in the world to have meticulously embellished the rear exterior in solid Gold."